RAVENOL Super Vakuumpumpen Fluid 100 is a highly developed lubricant, which was specifically developed for application in mechanically operated vacuum pumps. 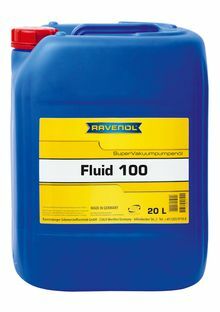 RAVENOL Super Vakuumpumpen Fluid 100 consists of specifically produced base oils and a high-performance additive system. This ensures an extremely low vapour pressure and a maximum efficiency of the pump. The oxidation inhibitor system prolongs the service life of the lubricant, which is subjected to high pump loads and high operating temperatures. RAVENOL Super Vakuumpumpen Fluid 100 is recommended for the lubrication and cooling of piston and rotating blade vacuum pumps, which primarily work with air. It is particularly suitable for pumps, which are operated under high operating temperatures (100 - 130°C). RAVENOL Super Vakuumpumpen Fluid 100 is compatible with standard sealants and hose materials with the exception of natural rubber, ethylene-propylene-diene monomers (EPDM) and latex. Mixing with other vacuum pump fluids reduces the performance of RAVENOL Super Vakuumpumpen Fluid 100. However, RAVENOL Super Vakuumpumpen Fluid 100 is compatible with mineral oils, poly-alpha-olefins (PAOs) and several semi-synthetic lubricants. RAVENOL Super Vakuumpumpen Fluid 100 is NOT compatible with polyglycol based products. RAVENOL Super Vakuumpumpen Fluid 100 is also recommended for application in vacuum pumps, which work with inert gases, e.g. nitrogen, hydrogen, carbon dioxide, carbon monoxide, argon, neon and helium. RAVENOL Super Vakuumpumpen Fluid 100 is NOT recommended for pumps, work with severely oxidising vapours such as fuming nitric acid, sulphuric acid, hydrogen sulphides and glacial acetic acids. Excellent synthetic-like resistance against thermal degradation. Prolongs the intervals between changing fluids. Increases the pump reliability and reduces the maintenance costs. Minimises deposits in vacuum pump systems. Ash-free formulation with non-toxic base oils. Provides for a clean workplace virtually free of oil mist and odours. Fluid with high viscosity index. Strong lubrication film in a wide temperature range. Improves the energy efficiency ratio. Protects pumps against corrosive factors from air, moisture and standard laboratory solvents.